New poetry collection by author of Saunter (co-winner of the Univ. of Georgia Press Poetry Series Open Competition) and The Novice Mourner (winner of the Dorothy Brunsman Poetry Prize). "The poems in Mad Cursive move gracefully between beauty and destruction, the essential real locale of poetry in our times. A mad swordsman inside a poet-seer, McKinney dares to locate what resembles, in my reading, spirit laid bare. In this truly elegant book, the remnant of our language negotiates a shadow world--that space between life and death--which is life on this earth. 'Inside sword we find word,' indeed. A truly courageous book. "In an era of distress and shrillness, it takes courage and, more than courage, Grace, to speak out boldly , unguardedly, for Balance. In the literal body of these new poems, Joshua McKinney articulates the mortal grandeur and (this is more poignant than I can rightly say) the tragedy of Balance. McKinney simply will not relinquish either past or present, love or bereavement, intellect or animal anguish, merely to accommodate the shrill urgings of our moment. Mad Cursive is therefore, and shall remain, a heroic collection." 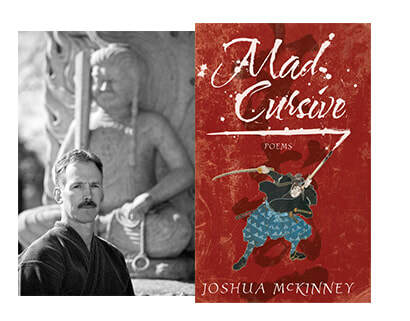 "Mad Cursive is an excellent use of poetry as a vehicle for real thought: a good read." Joshua McKinney is the author of two previous collections of poetry: Saunter, co-winner of the University of Georgia Press Poetry Series Open Competition in 2001, and The Novice Mourner, winner of the Dorothy Brunsman Poetry Prize in 2005. He is also the author of two poetry chapbooks: Saunter (Primitive Publications, 1998) and Permutations of the Gallery (Pavement Saw Press, 1996), winner of the Pavement Saw Chapbook Contest. His work has appeared widely in such journals as American Letters & Commentary, Boulevard, Colorado Review, Denver Quarterly, Kenyon Review, New American Writing, and many others. Other awards include a Gertrude Stein Award for Innovative American Poetry. He teaches poetry writing and literature at California State University, Sacramento. He is a member of Senkakukan of Sacramento where he studies Mugai Ryu, Toyama Ryu, and the curriculum of theZen Nihon Battado Renmei.